A market that just keeps on growing. 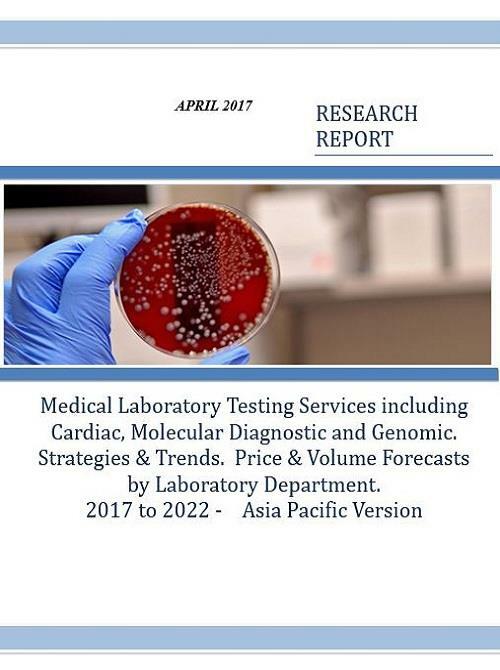 Clinical laboratory testing is positioned to directly benefit from the explosion in biotechnology, especially genomics. A range of dynamic trends are pushing market growth and company valuations. “Medical Laboratory Testing Services including Cardiac, Molecular Diagnostic and Genomic. Strategies & Trends. Price & Volume Forecasts by Laboratory Department. 2017 to 2022 - Asia Pacific Version" provides data that analysts and planners can use. Hundreds of pages of information including a complete list of Current 2017 United States Medicare Fee Payment Schedules to help sharpen your pricing. Make facilities planning decisions. Forecast demand for new testing regimes or technologies. Make research investment decisions. Order an Enterprise Version specifically customized for your organizations needs for distribution throughout your company. Based on extensive primary and secondary research the testing volume data is broken down into price and volumes allowing researchers and investors to quickly create informed and reasonable forecasts of demand. Assistance in providing specific growth and market size estimates for new technology tests is normally provided without additional charges. Existing laboratories and hospitals can use the information directly to forecast and plan for clinical facilities growth. The report includes detailed breakouts for 5 Countries and 1 Region. A detailed breakout for any country in the world is available to purchasers of the report. Make investment decisions and valuations with confidence using the latest data. 2.4.12 Clinical Reference Laboratory, Inc.
2.4.14 Miraca Life Sciences, Inc.
2.4.33 American Pathology Partners, Inc.
2.4.34 Integrated Regional Laboratories, Inc.
3.1.1 Understanding the Impact of Aging Population. 4.5 Mars, Incorporated to Acquire VCA Inc.
4.9 Schryver Medical Completes Acquisitions of Professional Clinical Laboratory, Inc.
4.22 Forte Capital Lowers stake in Laboratory Corp.